Santa Fe, N.M. – Fernando Barros Lirola grew up in Granada, Andalusia, Spain, where as a young boy, he learned to sing in the caves of Granada with the extraordinary flamenco voices of the Gitanos. Born in Granada Spain in 1952, Fernando studied at the University of Granada. Since 1980 he has performed in concerts and at Andalusian flamenco festivals around the world. Fernando is a singer (cantaor), composer, writer and innovator of flamenco music, with emphasis on bringing voice to the poets and writers of Spain. “Relocating to Santa Fe has been wonderful. So much happens here, and we have such a great response to our music. 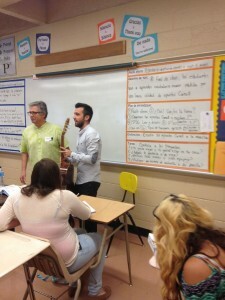 I am excited about traveling the country teaching and performing,” Lirola said. He is currently a cultural ambassador for Andalusia, Spain charged with disseminating information about flamenco and Andalucía. He brings his knowledge and understanding of flamenco, and his unique innovative vocal expressions to literary flamenco performances and lectures in Santa Fe, the United States and around the world. Fernando is the author of two books including “Flamenco en las Aulas”, and is now finishing a second book. He will also open the ‘International Center of Flamenco’ in Santa Fe next year. He is at the leading edge of integrating the tradition of flamenco with his unique understanding of its cadences and rhythms, as well as the “melody” inherent in the poetry of his countrymen. His innovations include use of the voice as an instrument of positive expression, combining traditional melodies with harmonies unique to the flavors and textures of the verses, and in engaging the audience in the meaning of expressive emotions. 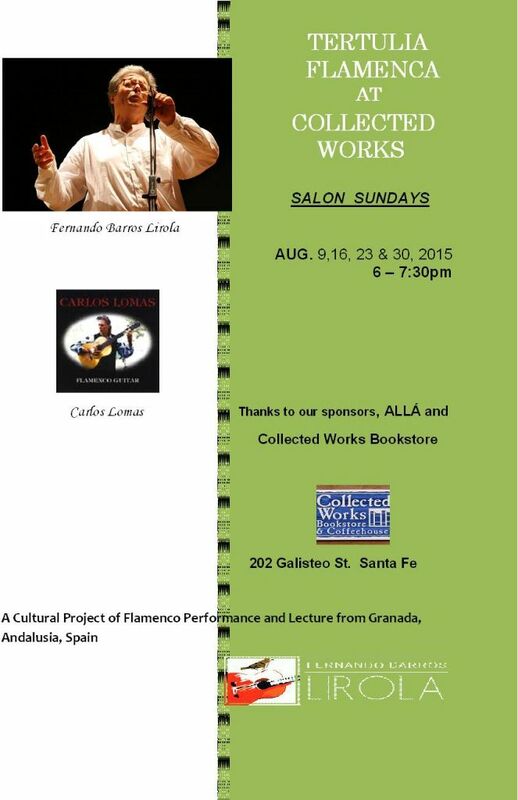 The Tertulia Flamenca Series at Collected Works is a cultural project of flamenco performance and lecture inspired by Granada, Andalucía, created and presented by Mr. Lirola. This innovative musical interpretation will include live and video settings for the poetry and prose of four exemplary writers in Spanish history: Miguel De Cervantes, Antonio Machado, Federico Garcia Lorca, and Juan Ramon Jimenez. These flamenco literary and performance gatherings are a natural collaboration with two important literary locations in Santa Fe, Collected Works Bookstore and Alla. “Salon Sundays” are open to the public. Attendees are invited to attend one or more evenings, as each performance will feature a different author at its root. Therefore, musical performance and lecture elements will also differ each Sunday night.